Cows are aborting their calves after eating dog excrement their owners have not cleared up, a farmer has claimed. Mr Willis said: "The dog poo does seem to be toxic to cows and how they are calving premature. It's a big issue." Paul Willis, who farms in Street, has also blamed the number of dogs being left off the lead for increases in cattle worrying. Avon and Somerset Police have said they were "working closely" with Mr Willis to resolve the issue. Beat manager, PC Roy Strong, said: "We enjoy an excellent relationship with Mr Willis and speak to him regularly. "When issues are reported to us we take them seriously and explore all opportunities available to us to solve the problem and, where necessary, identify the people responsible." In November, one of Mr Willis' calves was attacked by a dog off the lead. He said: "People are bringing their dogs to the footpath and letting them off the lead and they're running round the fields. "When there's cattle there, they're tormenting the cattle and we've had an animal that's been bitten and pulled down by a dog." Dog excrement can be damaging to cows by spreading an infection of an organism called neospara. Vet Andrew Davies said: "It is shed by cattle which have had previous abortions in their cleansings and discharge after calving. "If this is picked up by dogs it can then be excreted to cows grazing or into the feedstock, back into the silage and then be potentially eaten by cows and produce another abortion again." The issue of dogs left off leads and livestock worrying has also been raised with Mendip District Council. 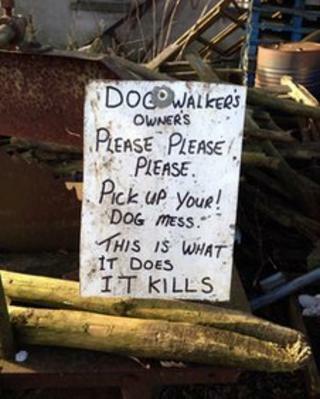 A spokesman for the council said: "We always encourage responsible dog ownership and ask dog owners to make sure they keep their pets under control at all times. "While we are limited in the action we can take against dog owners who let their animals on to private land, our dog warden will be contacting Mr Willis to discuss his concerns and see whether there is anything we can do to help."